Note: ... and of course, this could help HER too, to take better care of him/her.... Or maybe to start develop a Softlove? Motion, audio, and location data harvested from a smartphone can be analyzed to accurately predict stress or depression. Many smartphone apps use a device’s sensors to try to measure people’s physical well-being, for example by counting every step they take. A new app developed by researchers at Dartmouth College suggests that a phone’s sensors can also be used to peek inside a person’s mind and gauge mental health. When 48 students let the app collect information from their phones for an entire 10-week term, patterns in the data matched up with changes in stress, depression, and loneliness that showed up when they took the kind of surveys doctors use to assess their patients’ mood and mental health. Trends in the phone data also correlated with students’ grades. The results suggest that smartphone apps could offer people and doctors new ways to manage mental well-being, says Andrew Campbell, the Dartmouth professor who led the research. Previous studies have shown that custom-built mobile gadgets could indirectly gauge mental states. The Dartmouth study, however, used Android smartphones like those owned by millions of people, says Campbell. “We’re the first to use standard phones and sensors that are just carried without any user interaction,” he says. A paper on the research was presented last week at the ACM International Joint Conference on Pervasive and Ubiquitous Computing in Seattle. Campbell’s app, called StudentLife, collects data including a phone’s motion and location and the timing of calls and texts, and occasionally activates the microphone on a device to run software that can tell if a conversation is taking place nearby. Algorithms process that information into logs of a person’s physical activity, communication patterns, sleeping patterns, visits to different places, and an estimate of how often they were involved in face-to-face conversation. Many changes in those patterns were found to correlate significantly with changes in measures of depression, loneliness, and stress. For example, decline in exposure to face-to-face conversations was indicative of depression. The surveys used as a benchmark for mental health in the study are more normally used by doctors to assess patients who seek help for mental health conditions. In the future, data from a person’s phone could provide a richer picture to augment a one-off survey when a person seeks help, says Campbell. He is also planning further research into how data from his app might be used to tip off individuals or their caregivers when behavioral patterns indicate that their mental health could be changing. In the case of students, that approach could provide a way to reduce dropout rates or help people improve their academic performance, says Campbell. “Intervention is the next step,” he says. “It could be something simple like telling a person they should go and engage in conversations to improve their mood, or that, statistically, if you party only three nights a week you will get more decent grades.” Campbell is also working on a study testing whether a similar app could help predict relapses in people with schizophrenia. A startup called Ginger.io with an app similar to Campbell’s is already testing similar ideas with some health-care providers. In one trial with diabetics, changes in a person’s behavior triggered an alert to nurses, who reach out to make sure that the patient was adhering to his medication (see “Smartphone Tracker Gives Doctors Remote Viewing Powers”). Anmol Madan, CEO and cofounder of Ginger.io, says the Dartmouth study adds to the evidence that those ideas are valuable. However, he notes, much larger studies are needed to really convince doctors and health-care providers to adopt a new approach. Ginger.io has found similar associations between its own data and clinical scales for depression, says Madan, although results have not been published. Both Ginger.io and the Dartmouth work were inspired by research at the MIT Media Lab that established the idea that data from personal devices offers a new way to study human behavior (see “TR10: Social Physics”). Yaniv Altshuler, a researcher who helped pioneer that approach, says the Dartmouth study is an interesting addition to that body of work, but it’s also a reminder that there will be downsides to the mobile data trove. Being able to use mobile devices to learn very sensitive information about people could raise new privacy risks. Campbell—who got clearance for his study from an ethical review board—notes that his results show how existing privacy rules can be left behind by data mining. A health-care provider collecting data using standard mental health surveys would be bound by HIPAA data privacy regulations in the United States. It’s less clear what rules apply when that same data is derived from a phone app. “If you have signals you can use to work out, say, that I am a manic depressive, what governs use of that data is not well accepted,” he says. Yesterday, The New York Times published a piece about how the constant distraction of digital media damages "creativity and deep thought, interrupting work and family life." It's not a new worry. A few years ago, Nicholas Carr wrote a story for the Atlantic called "Is Google Making You Stupid?" and his new book, The Shallows, expands on that theme, arguing that the internet is eroding our capacity for "solitary, single-minded concentration." So is the internet actually bad for our brains? A handful of bloggers have reported feeling that it's been bad for theirs. But why not find out for yourself? 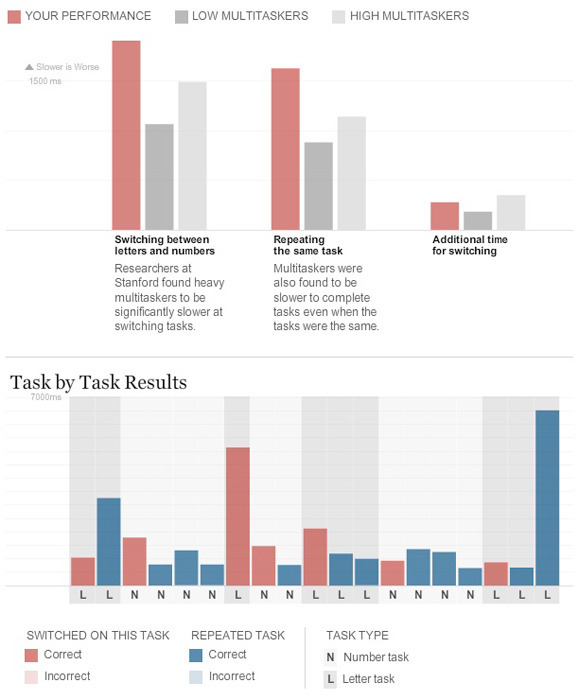 The Times has two interesting cognitive games you can play online that will test how easily distracted you are and how good you are at switching between tasks. I'm someone who spends my entire working day being distracted by online content, and then creating new chunks of online content designed to distract others. My results are below. I scored well on the first test. I'm hard to distract. In fact, I had a perfect score when faced with the most distractions. On the second test, it was a mixed bag. I didn't make a single mistake, but I was really slow. My own subjective feeling is that the internet has shortened my attention span. If I sit down to read a book at night, it sometimes takes an alarmingly long time for my brain to settle into it. And I have to fight the urge to screw around on my phone on the commute home. 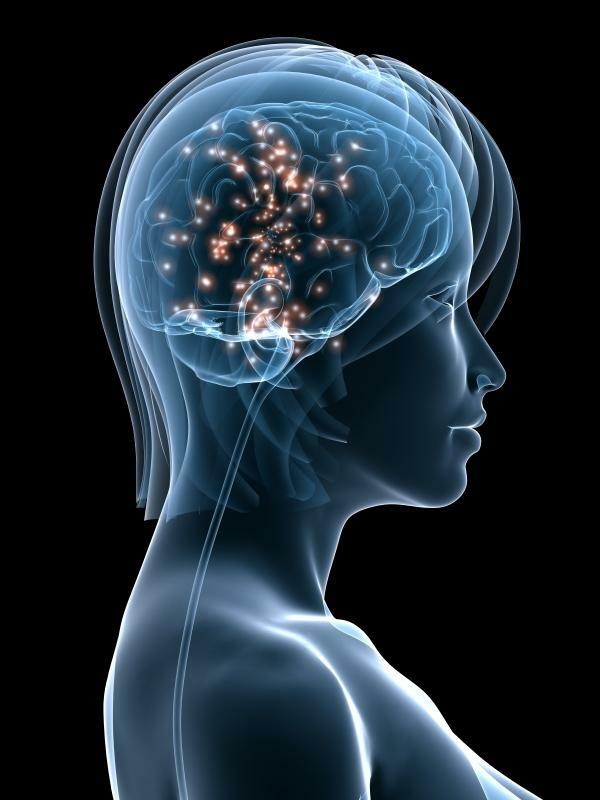 Jonah Lehrer, contra Carr, argues that the neuroscientific evidence to back this up is thin. How did you do on those tests? Have your internet habits affected your mind? New Scientist published an interesting article this week about the influence of the body's positioning in space on one's thought processes. According to recent research, space and the body are actually much more connected to the mind than has been traditionally accepted. The article cites a study by researchers at the University of Melbourne in Parkville, Australia which found that the eye movements of 12 right handed male subjects could be used to predict the size of each in a series of numbers that the participants were asked to generate; left and downwards meant a smaller number than the previous one, while up and to the right meant a larger number. A separate study at the Max Planck Institute for Psycholinguistics in Nijmegen, the Netherlands, asked 24 students to move marbles from a box on a higher shelf to one on a lower shelf while answering a neutral question, such as "tell me what happened yesterday". The resulted showed that the subjects were more likely to talk of positive events when moving marbles upwards, and negative events when moving them downwards. interact through the pineal gland in the center of the brain.